It is tempting to dive right into a landscaping project, but having a budget is a key first step to guide the project. A budget will help you estimate the costs and ensure you plan for all aspects of the outdoor project. Breaking down the landscape plans and researching prices will get you to an accurate cost estimate so you aren't surprised with unexpected expenses. Size matters when it comes to landscaping estimates. The larger the project, the more money it costs in materials. Start with a sketch on grid paper that shows your property. 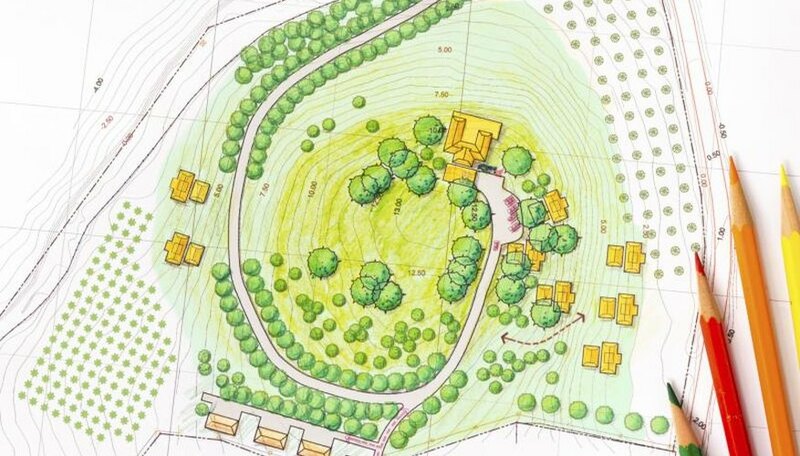 Take measurements of your house, trees, fences and other structures that will stay, and draw those objects on the sketch. Deciding the sizes of landscaped areas you plan to add, such as planting beds and patios, also is important. Add those features in the drawing with the measurements written in for reference. After you've determined all parts of your landscaping project, break down each part to create a list of all necessary materials. For example, installing a paver patio requires sand, gravel, edging and pavers. Consider all extra tools you'll need. For the patio project, you may need a tamper to compact the sand and a saw to cut the pavers. Factor in modifications to the home to make the project work, including those that require a professional. If, for example, your plans include hard-wired landscape lighting, obtain estimates from professional electricians for the electrical work. Doing the work yourself saves money, but some jobs are better left to professionals. You also may need permits, which add to the project's cost. The list of materials needed for the landscaping project will help you estimate costs. Most landscaping products come in a variety of materials that vary in price. Brick pavers are less expensive per square foot than flagstone, for example. Browse the options at a home-improvement store to see what is available for each item on the materials list. Write the prices for the top options for each item on your list. Record the material's brand name and cost per square foot. If the material comes in a bulk package, write down how much area the package's contents cover. Getting an accurate estimate of costs requires you to do some basic math. Refer to your sketch of your property to determine how much of each material is needed. If, for example, you will make a 12-by-12-foot patio, then you'll need enough pavers to cover 144 square feet. Multiply the number that reflects the amount of material needed by the cost of that material. If, for instance, your selected pavers cost $2 per square foot, then the amount of pavers needed to cover 144 square feet will cost $288. Combine the costs for all of the materials in the landscaping project. If their total adds up to more money than you have available, then consider cutting back on some parts of the project, using less expensive materials or making a landscaped area smaller.